Internationally recognized artist Janet Kruskamp is published and licensed worldwide by Bentley Licensing Group, and is renowned for her versatility and the ability to capture the essence of the many diverse subjects she creates. Janet's artistic talents surfaced very early in life. Her father once joked that she was born with crayons in one hand and a paint brush in the other! By the age of two Janet was already a prolific artist drawing such characters as the Planters' Peanut Man and many Disney characters. She would creep behind the clothing in her parent’s walk-in closet and draw on the walls, which soon led her parents to supply her with proper artists’ materials. "I always knew I was going to grow up to be an artist. There was never a period in my life when I didn’t know this, people are born with certain genes for certain talents and mine was for art, music and creative writing... the strongest attraction for me was art," says Janet. In the summer of 1952, Janet graduated from high school and also met her future husband, Hardy Kruskamp, a sergeant in the Marine Corp who had recently returned from a tour of duty in Korea. They married the following year and began their family, two boys, Charles and Stephen and a girl, Jenifer and in later years they were blessed with five grandchildren. Janet continued painting, winning awards exhibiting her work in galleries and very soon art museums and also held numerous one woman shows. 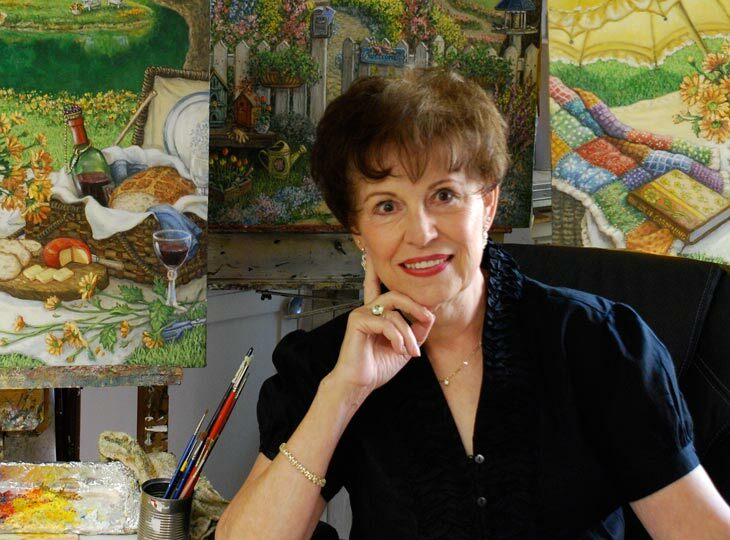 Janet also found time to teach private art classes for adults and children, and she also juried art competitions and was president of the local art association. By the early 1970’s, Janet’s great popularity had spread from regional to national to International recognition. See Articles and Reviews. Her love of finding beauty from the commonplace,everyday scenes or items prompted Ted Bredt, San Jose Mercury News art critic to write :…”It is always refreshing to view the work of a competent artist such as Kruskamp,working in the Romantic Realist tradition. Refreshing because one doesn't need a degree in art history to understand it ---one needs only to be human.” ”Beauty from the Commonplace”, California Today, San Jose News Sunday Magazine, June 10th, 1973. In 1975, Janet's work was featured in Southwest Art Magazine. Author and art critic Janice Lovoos writes:”…..Her work evokes tenderness,nostalgia and generally a mood of happiness. Some of these qualities undoubtedly spring from the artist herself, a vibrant,beautiful woman.” “Janet Kruskamp’s America” Southwest Art, June 1975, Author Janice Lovoos. The show opened in June 1976 at the Rosicrucian Egyptian Museum Gallery in San Jose, California to great acclaim by the media and the public. This magnificent collection of Americana was endorsed by the San Jose Bicentennial Committee as an “official Event”. Ted Bredt called Janet “The Santa Clara Valley’s formost exponent of Romantic Realism,”A Romantic Display”,San Jose Mercury News Sunday Magazine, July 11th 1976, Author Ted Bredt. In 1979, Janet wrote an article for Northlight Magazine, “Painting From Your Own Photos… Another View” Northlight Magazine, Feb 1979. And was one of the featured women in San Jose Magazine: ” Women Who Make A Difference” Author Susan Thomas, Jun/July 1979. Although Janet had never planned to also become a well known portrait painter,this facet of her versatility brought her to yet another of the many subjects that her brush lovingly touched. By 1990,she was accepting numerous commissions for portraits of adults,children and even their pets. ”Famed Artist Turns To Portrait Painting”, Author Leslie Vestrich, Los Gatos Weekly, April 25th, 1990. In 1991, for the first time in Janet’s life, her brushes lay untouched. Her beloved husband of 38 years, Hardy, was found to be terminally ill with a brain tumor. Sadly, he passed away in August of that year and Janet’s grief took from her the creative spark and energy she had always possessed. From the beginning of 1991 until the end of 1992, Janet completed only seven paintings, most of which were commissions she had accepted before her husband’s illness. Based on her friend’s recommendation, Janet chose to send three photos of her work to that publisher and within a few days was offered a contract! From 1993, a whole new world opened up for Janet….the world of open edition prints and an extra bonus, the very lucrative licensing market and her work soon became more and more in demand in that market also…and yes her work does travel around the world just as her friend said it would! ”Artist Pursues Cats, Bears Fur good Reason” Los Gatos Weekly-Times, Author: Shari Kaplan, Jan. 8th, 1997. Janet’s work is in great demand, nationally and internationally in the field of print and licensing and she constantly shifts from one subject matter to another to suit the needs of her publisher and their buyers. Her studio is brimming over with originals, cabinets full of prints, and hundreds of samples of licensed products using Kruskamp images. ”Portraits to Products” Art Expressions, author Robert Sher, Feb 2003. In recent years many of Janet’s agents and personal clients requested ”personally enhanced, hand signed” giclees, which also proved to be a highly successful endeavor. With that in mind, Janet decided to go one step further and open a website offering giclees to a wider audience. If all her previous projects are any indication, her Web site should be another smashing success. Says Janet, ”When someone who hasn’t seen me for a while asks me if I am still painting, I wonder in amazement at their question! I guess they don’t realize, being an artist is not just what I do, IT”S WHO I AM! In November 2002 Janet attended a high school reunion in Southern California. Her classmate, James Pogue Sr. also attended the event and the two "re-met" after over 50 years...so you might say it was "love at second sight", because in November 2005 they were married in Janet's hometown in Northern California where they will spend most of their time when they are not travelling around the country in Jim's 36 foot 5th wheel trailer. "All the comforts of home on wheels! Great fun!" says Janet. Jim is a retired Firefighter and Sr. Fire Inspector for Los Angeles City Fire Dept. and owns property in Arizona, so each winter the "Newly weds" plan to spend the winter months in Arizona where Janet has set up a second studio to continue producing paintings for Bentley House.